I attend a weekly life drawing group at McGuffey Art Center, my local artists co-op. The center actually has three sessions, a weekday morning, a weekday evening, and a weekend morning. Understandably, this is a pretty popular resource in the art community. After at least a decade, the organizers are having a show of not just MAC members, but of work from anyone who attends any of the drawing sessions. The photo above is the hanging in progress. Here are three of my drawings, amongst the hundred or so on display. The show will be up for the month of February. Friday was the opening reception and it was great to see so many people upstairs enjoying the art. Usually the ground level gallery gets the majority of traffic, so it was fantastic to see the life drawing groups get some well-deserved attention. Blurred Boundaries started today and runs through September 4th. It is a Mixed Media Fiber Art exhibit Juried by Virginia Spiegel and curated by Lynn Krawczyk. The definition of Fiber Art has evolved greatly over the past few years, opening up a new range of possibilities to artists working in various disciplines. Fiber artists are incorporating more mediums into their work, creating unique art that reaches across previously defined boundaries. Artists from other mediums are discovering the infinite possibilities that fiber can offer, also creating hybrids that are eye catching and moving. Blurred Boundaries seeks these arttworks for a week long exhibition honoring the ingenuity of mixed media fiber art. The exhibit will be open to the public during the following hours: 12:00 p.m. to 5:00 p.m.
IMG_2704, originally uploaded by Umzavi. The good news first: these two lovelies were both accepted into the “Blurred Boundaries“ exhibit at the Fabrications Retreat in Kalamazoo Michigan (August 31 — September 4, 2009)! Fiber artists are incorporating more mediums into their work, creating unique art that reaches across previously defined boundaries. Artists from other mediums are discovering the infinite possibilities that fiber can offer, also creating hybrids that are eye catching and moving. … and I knew that these combinations of quilting, collage, embroidery and embellishment, presented on stretcher bars like a painting fit the bill. Now the reality. 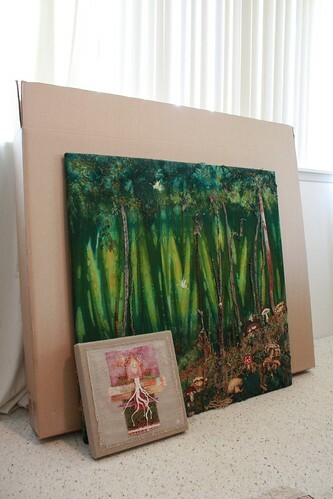 Even at a modest 32″ square, “Fairytale Forest” requires an oversize box by mailing standards. It will cost me literally hundreds of dollars to mail it to and from the exhibit. I’m taking a deep breath and chalking it up to the cost of doing business. But, it got me thinking about future artworks. Do I edit myself by not mounting large works in this manner, even though, in my mind, it called for it? Do I not try to exhibit large works that can’t be folded? Do I stick to small work? As an artist, I don’t want to limit my creative options so I will pay up — but I can sure see why so many painters want to live within driving distance of NY where the galleries are! Little “Pink House” was not without her hurdles either. I needed to decide how to sign the piece since a quilty label on the back wasn’t necessarily the only option. I opted to sign and title the front like a limited edition print, but once done, it looked awful! I just couldn’t live with the distraction on the bottom of the canvas. So, in a fit I cut the canvas out of it’s frame, leaving the offending name and title behind. I then sewed the art back onto another canvas. It looks much better, but in a way it defeats my purpose of the collage being an integrated part of it’s canvas ground. It is what it is and the imagery is still just as pretty as the original version, so I emailed a photo to the event coordinator (knowing that they reserved the right to reject any art that did not live up to it’s entry photo). She wrote back saying I was much calmer than she would be, and that, of course, the art was still welcome in the show. Relieved, I replied that I only seemed fine because tears of frustration don’t email well! Then, I grabbed another canvas and a pile of bits and got sewing on a new composition.